The Swampdwellers Skiffle Band - It's all their fault. John Donoghue:- "I was born in Northland, NZ. My family moved around the North Island a lot in the first few years of my life before finally arriving in Miramar, Wellington just before my eighth birthday in 1956. One day, just as things were beginning to settle down, “It’s in the Bag” came to town. This was circa B.T. (before television) and “Its in the Bag” with Selwyn Toogood was the highest rating radio show In NZ. The venue was the Miramar Central School Hall, and was fully booked out. My parents had purchased our tickets early, so we had good seats, and could see everything. “It’s in the Bag” featured a short break during the live broadcast. This was so the technicians could play a pre-recorded “...message from our sponsors...” A local act had been booked to fill in this gap for the live audience. The local act that performed that night was "The Swampdwellers Skiffle Band." Selwyn Toogood himself announced them on. Carrying washboards and tea-chests, they rushed out onto the stage and began belting out a highly animated Lonnie Donegan song. Before they could finish a red light came on and they rushed off again. To an eight-year-old this was wildly exciting and totally amazing. I thought that the Swampdwellers were by far the best band I’d ever seen. Of course, they were the only band I’d ever seen, but all that aside, life’s never been the same since. I recognised the “Swampdwellers” guitarist, Mike Shackleton. Mike was the same age as my sister Marion and our mothers worked together at “The Lamphouse,” in Maupuia Road. Mike also had a younger brother, Andy, who was closer to me in age. After the “It’s in the Bag” show, I became very interested in what the Shackleton boys were getting up to after school and on the weekends. The Shackleton’s house in Brussels Street had a big old shed out the back. The boys had taken it over and the Swampdwellers held their band practices there. There were a variety of musical instruments lying around and an old wind-up gramophone that sat on a bench surrounded by piles of ‘78’s. 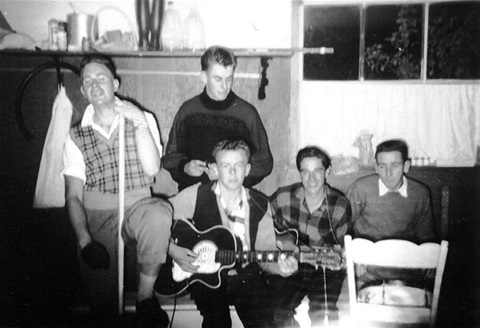 Andy had also formed a Skiffle Band, with his schoolmates Rod Stone and Johnnie England. 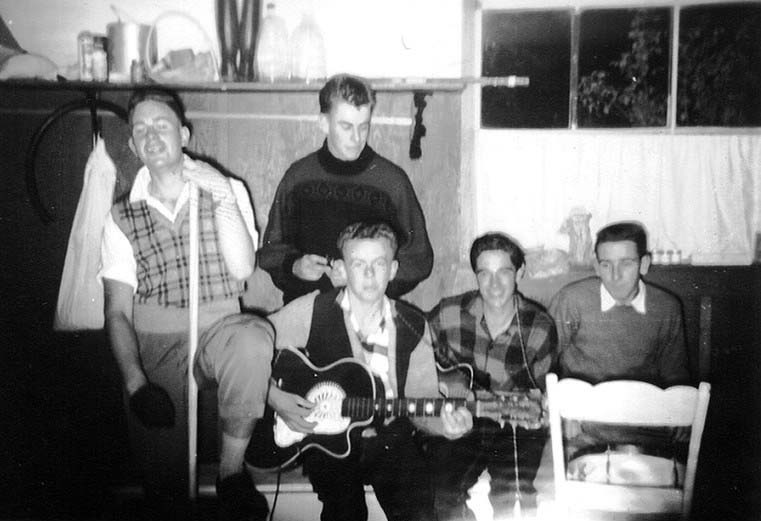 They called their band “The Skiffle Scholars.” About dinner time when the Swampdwellers packed up and left the shed, the Skiffle Scholars took over. The boys had a banjo, a ukulele, a washboard and a tea-chest bass with the name of the band painted on to it. Sometimes when they were jamming they would let me sit in with them, usually playing the Tea Chest. Inspired by the adventure of it all, I formed my own Skiffle Band at Miramar Central Primary school. The members of my band were Eddy McDonald, Ian Stephen, Laurie Thomas and Dave Reid. We would perform in the school playsheds on rainy days. I played my Dad’s old Tenor guitar that he had tuned to an open “C” chord for me. The rest of the band played percussion instruments that we borrowed from the school. We had our first serious public performance at a school concert held in the very same hall that the Swampdwellers had performed in. For this big event I borrowed Andy’s tea chest bass for Dave Reid to play. We were all dressed as pirates for a play we were performing in that evening, so I named my band “Johnnie and the Cutthroats.” However, Andy’s Tea Chest still had "Skiffle Scholars" painted on it so people assumed that was our name of our band. It turned out to be a life-changing night for me and those who were there still remember it. Later on we changed the name of our band to "The Rhythm Wreckers," and then "The Vultures." One day Andy and I were out in the Shackleton’s shed when suddenly, for no apparent reason, he tore his banjo apart and rebuilt it as a snare drum. That “snare drum” became the centrepiece of a "drum kit" he built out of pots and pans and old buckets and stuff. He would sit in with Mike’s band when they practiced in the old shed. In no time at all he became their regular drummer. John Donoghue performing with the Strangers, 1964. Steve Musaphia in background. "The Strangers" were one of the electric groups that grew out of the acoustic Skiffle Bands of Miramar in the early 1960's. 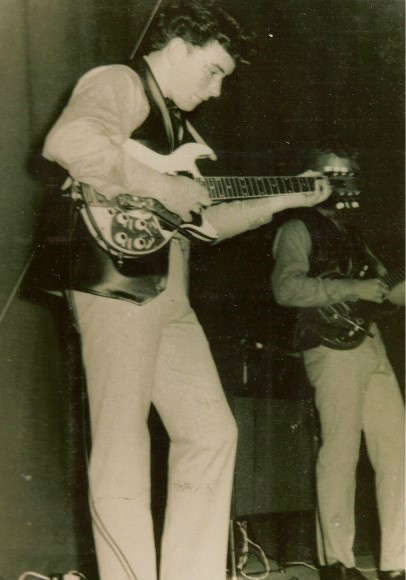 They first took to the stage at Wellington High School - as a backing band for the 1963 Music Competitions - with the original lineup featuring myself on lead guitar, Ian Stephen on rhythm guitar, Eddy McDonald on bass and Ian Taylor on drums. Following the music competitions we named our new band "The Crescendos," (after the Librettos) and began playing the Eastern Suburbs Youth Club Circuit, with Eddy's younger brother Steve replacing Ian Taylor on drums. Ian Stephen left the band in late '63 and we found a replacement in Steve Musaphia from Seatoun. Steve brought a new enthusiasm into the band and almost immediately he and I began writing songs together. We re-named the band "The Strangers," -after a Shadows number we used as a Signature Tune- and debuted the new lineup at Saint Columbine's Hall, Miramar, in early 1964, as support band for "The Mustangs." "The Strangers" went from strength to strength very quickly, soon outgrowing the suburban dance circuit and breaking into the major Wellington venues. We were one of the first Wellington bands to feature an electric twelve-string lead guitar and began carving out a niche for ourselves in the emerging "Folkrock" genre. Before long we'd become regular performers at Wellington's "Teenarama" and had started supporting major touring artists. All this giddy momentum came to an unexpected and abrupt halt when Eddy, who was an apprentice carpenter, suffered an industrial accident that injured his left hand. The McDonald's father, Eddy Senior, who was acting as our manager at the time, called a meeting and formally dissolved the Band. Following the demise of "The Strangers," Steve Musaphia and I formed the short-lived "The Leaders," with Doug Reid, Warren Willis and Brien McCrea, all of whom developed further music careers. Eddy McDonald, when fully recovered from his accident, became a foundation member of legendary NZ recording stars "The Avengers." Cheshire Katt, 1967. L to R Dennis McCann, Doug Reid, John Donoghue, Colin McClean. The Cheshire Katt began as a vocal trio featuring myself on guitar, Dennis McCann, (a singer The Crescendoes" had backed in the Wellington High School Music Competitions) and Doug Reid, bass player from the "short-lived" Leaders. "The Leaders" had folded suddenly and prematurely when our drummer, Brien (The Toad) McCrea, raced out and bought himself a nice, shiny new surfboard with the money we'd given him to buy a drumkit. The new vocal trio called itself "Pudding est 1883" and advertised for a drummer. We got Tim Taylor, from Kelburn. Tim brought along his friend Keith Norgate, who played keyboard and suddenly "Pudding est 1883" were a five-piece band. The five-piece band then changed it's name to "Cheshire Katt," after the bearded, bongo-playing, beatnik cheshire cat in Hannah-Barbara's "Alice in Wonderland" movie. The new quintet rented a garage on Lyall Bay Beach and rehearsed over the summer of 66/67 until we had built up an extensive working repertoire. In 1967 the Cheshire Katt became a national news item by attempting the world non-stop band-playing record at the "Las Vegas" Nightclub in Kilburnie. Tim and Keith left the band shortly after and we recruited Colin McClean on drums, from Wellington band, "Catch Hands." This four-piece Katt was able to capitalise on the publicity generated by the world record attempt. We began working around Wellington night-spots with regular appearances at The Place, The Downtown Club and the Blue Grotto Club, where we became resident band. Gene suggested that we try our luck in Auckland and arranged a series of Auckland appearances for the Cheshire Katt in early 1968. The tour was so successful that we tossed in our day jobs, moved to Auckland and took up residency at the Club-a-go-go, in Newmarket. 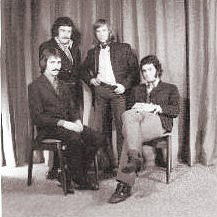 Artistic differences resulted in the band becoming a trio in January 1969. The new three-piece Cheshire Katt took up residency at Queen Street's notorious downtown night-club, "The Bowl", and throughout the summer and autumn of 1969 shared the gig with Auckland's "Stax-Volt Revue band." The new Cheshire Katt quickly developed into a tight soul/rock/blues combo. The band started touring the provinces, and although voted Rotorua's "Most popular Band of 1969," the constant touring and the frustrations of not being able to secure a recording deal resulted in a steady drop in band morale. Finally, at the end of a particularly grueling Northland tour in the Winter of '69 the Cheshire Katt formally disbanded. Doug and Colin remained living and working as musicians in Auckland. I returned to Wellington with the intention of moving on to Australia, but instead accepted an offer to join the Dizzy Limits for their trip to London in 1970. Wellington band The Dizzy Limits were something of an eastern suburbs supergroup, formed in 1965 out of the Strangers, the Pickadors and the Berets. The Dizzy Limits then became one of Wellington Manager Ken Cooper's stable of artists. They toured extensively, backed major artists and made regular appearances on TV shows "C'Mon" and "Happen Inn." In April, 1968 they won the Wellington Battle of the Bands. On the strength of that they negotiated a return trip to London with the Shaw Saville Shipping Line. 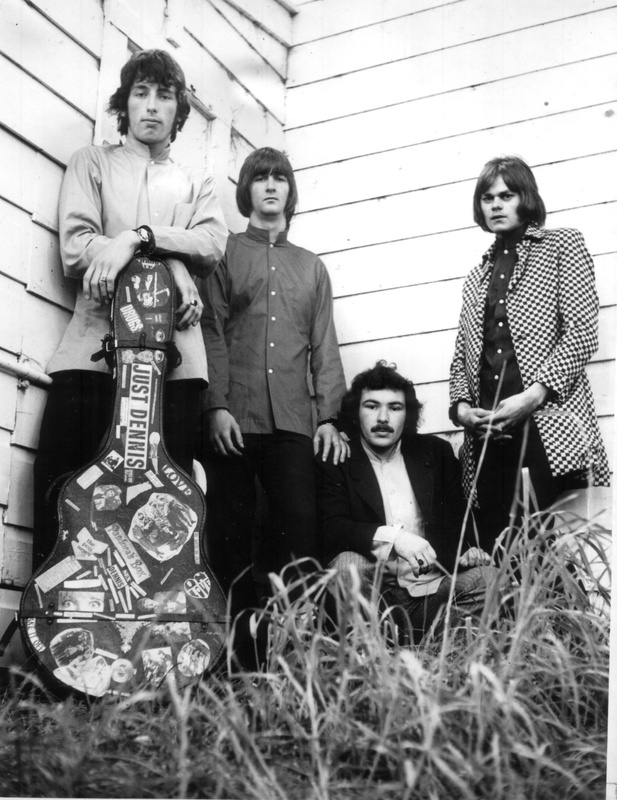 Guitarist Kelvin Diertrichs was unable to commit to the trip and I was invited to join the band in October 1969. The week I joined, the band entered HMV studios to record a cover of a Beatle's medley, "Golden Slumbers/Carry that weight." The record reached the NZ top ten and in an eerie anticipation of what was to follow with Timberjack, the video for the single was banned after its one and only airing on New Zealand Television. Undaunted, the Dizzy Limits sailed to the UK in July, 1970 aboard the SS Northern Star and returned later that year on the SS Southern Cross. As with other NZ bands who had experienced the London of the time, the group that returned was barely recognisable as the one that had left. A new attitude, a wild, long-haired look, a whole new repertoire and a brace of Marshall amps necessitated a name change. A band meeting aboard the Southern Cross as it entered Wellington Harbour produced the name "Timberjack," and the band operated under that title until its eventual demise in 1971. I recorded four sides with the Dizzy Limit; "Carry that Weight" b/w "Be my friend" in 1969 and "Wrote a song for everyone," b/w "Good Golly Miss Molly" in 1970. Good Golly Miss Molly was the first time the "Timberjack Donoghue" vocals were recorded for posterity, although it would be a few years before Ode Records graced them with a name.